Klinger: I’ve made no secret of the fact that as the 1990s wore on and on and on, I found myself increasingly tired of what alternative rock had become. I couldn't hear much beyond the unrelenting bleakness and/or the chamomile acoustic stylings that were all symptomatic of the times. At least that's the way I remember it. Anyway, imagine my surprise when I started hearing that the Flaming Lips, a group I had only been half-paying attention to, had just released an unabashed classic that mixed sunny psychedelia with gigantic beats, and in the process had created their masterpiece nine albums into their career. Then imagine my surprise when I heard the album and bought into the hype 100%. Coming at the tail end of the '90s, The Soft Bulletin was like opening a window on the first warm spring day of the year — and a bit like the end of an era. The lyrics, which sound suspiciously like something from a rock opera in which the plot points never quite got strung together, seemed to be about something and nothing at the same time. Scientists who are competing to achieve something or other, who eventually team up to rescue everyone? Bugs may be involved as well, although those references might all be a metaphor for heroin. And the arrangements took you up and down gently, in and out of a dreamy state and still puzzling over what it's all about. A far cry from all that grungishness that had been hanging over everything like a toxic cloud for so long. But you're far more receptive to that era, being that it's tied to your coming of age and such. Did you hear what I heard here? Mendelsohn: I completely missed this album. It came out my freshman year of college and I have no idea what I was doing. Well, I have a vague recollection, but it doesn’t include the Flaming Lips. It wasn’t until 2002’s Yoshimi Battles the Pink Robots that I finally got around to reconnecting with the Flaming Lips (for people coming of age in the 1990s, it was a requirement to know all the words to “She Don’t Use Jelly”). To be honest, I always preferred Yoshimi to The Soft Bulletin. But that’s just me —more electronics and less orchestration or maybe because it was my ticket back in. Also, Yoshimi was a little more coherent, a little more rock without actual rock. But once I got Yoshimi and started to work my way backward I found myself listening to a group who were completely different from their early 1990s iteration. The departure of guitarist Ronald Jones made them start over. Those three albums they made over those five years — Zaireeka, The Soft Bulletin, and Yoshimi — are just insane, a complete reimagining of what pop music could be. But for all the love I have for the Flaming Lips, I could never completely give myself over to their vision. I would find myself binging on their music for a week and then walking away from it for years. Returning to The Soft Bulletin so many years later, I still don’t think I truly understand. It’s so obtuse and yet so wide open. Klinger: Yeah, Yoshimi Battles the Pink Robots has a more pronounced theme — it's way closer to a straight-up concept album. Plus it has the more recognizable tracks on it, with "Do You Realize?? ", one of the most perfect songs of the 2000s, and the almost nearly as great "Fight Test". And yet somehow The Soft Bulletin is currently edging out Yoshimi on the Great List. The Soft Bulletin is at No. 136 (it's risen 50 places since last year, he says in a poor attempt at Casey Kasem's voice), and while Yoshimi is also on the rise, it remains further down the list at No. 196. Interesting, at least to rock nerds. It could just be a mathematical oddity, or it could have something to do with the idea that an album that came out in 1999 would still be fresh in the minds of best-of-the-decade listmakers, and thus it could rank a good bit higher. But I'm still tempted to think that there are other forces at work here. There's still a lot to be said for the idea that the shock of the new carries a good bit of weight among critics and fans. A band that can try out a whole new paradigm is going to get folks excited, and critics were most certainly enthralled. Interesting, though, that a lot of the contemporary reviews hailed Wayne Coyne as the driving force behind the band. Nowadays, as Coyne's public persona has become somewhat more, uh, problematic (see also Cyrus, Miley), more and more folks "in the know" have stressed the input of multi-instrumentalist Steven Drozd. Interesting, too, that there seems to be a reluctance to view the Flaming Lips as a collaborative process — we prefer our insanity to shine forth from one crazy diamond, I suppose. (Speaking of which, I hadn't really given much thought to the Flaming Lips' overall debt to Pink Floyd when I was first in thrall to the group, but now that I've spent more time immersed in their catalog, I'm picking up on Floydian slips throughout The Soft Bulletin.) Regardless, and not to get too far into so-called horse-race journalism (but what the hell, it's a political year), do you think Yoshimi will eventually overtake The Soft Bulletin on the Great List? Or have Coyne's recent shenanigans stalled both albums' momentum? Mendelsohn: Would I like to see Yoshimi over take The Soft Bulletin on the Great List? Yes, I would. Do I think it will ever happen? Probably not. The only real reason is the fact that The Soft Bulletin came first. Both records are so strong that the only tie-breaker is the virtue if being first. 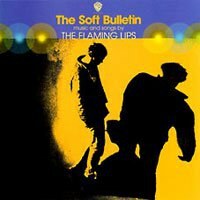 The Soft Bulletin is the opening salvo in the Flaming Lips' aural assault on the ears of the music listening populace. I don't think Coyne's career choices will have any real impact on the continued success of either The Soft Bulletin and Yoshimi. I hate to say this out loud, but I think the Flaming Lips are done and have been done since shortly after Yoshimi. Not as a band, but as a critical force, a group at the forefront of shaping music. I could be wrong, and they could be back with something unexpected. But, as we've talked about so many times before, these great albums are as much a product of time and place as they are of the artists behind them. For the Flaming Lips, it was the combination of Drozd's musical talent, Coyne's incredibly blunt yet powerful lyrical prowess, and Michael Irvin's increasing interest in the production side of music that combined to create The Soft Bulletin and later Yoshimi as well as the void left by the end of alternative music and a music populace looking for something new, something out of the ordinary. The Flaming Lips' new approach fit that bill and worked incredibly well because they had to tackle making music in very unconventional way. When Jones left the band, it forced the rest of the group to either find a new guitarist or think about rock music without guitars. They filled that void with orchestration, big beats, and emotional response. Once the Flaming Lips left that track, the magic disappeared. Klinger: I don't want to agree with you here, but I'm having a hard time refuting that sad statement. At War with the Mystics seemed a bit formulaic after the previous dizzying highs, and while a formula based on quirky oddness might be preferable to, say, Journey's stadium rock formula, but it's still a formula. Since then I've had a hard time getting excited about full-album covers of Dark Side of the Moon and such. Sometimes, as we discuss the extent to which the musical canon is actually settled business, I find myself wondering if bands aren't ill-served by the freedoms that they've gained. Would the Flaming Lips have been able to maintain more momentum if they were expected to crank out a new album at least once a year? Would they have been more likely to try to build on the sounds that they had created and developed a more consistent train of thought? Would they have had less time for the sort of horsing around that ends up trying people's patience? (I actually started thinking about this with the Beastie Boys as well, what with all their stopgap instrumental efforts and general lack of prolificness, but that just ended up making me sad.) Don't get me wrong — I haven't written the Flaming Lips off altogether, but returning to The Soft Bulletin after a few years away (and hearing it in stark juxtaposition to last year's The Terror) has me, for quite possibly the first time ever, pining a bit for the optimism and exuberance of the 1990s.